(CNN) -- The Polish city of Krakow played host to a unique collection of some of the world's leading classical musicians on Tuesday for a special performance to mark the 70th anniversary of the outbreak of World War II. 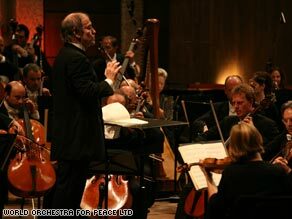 Valery Gergiev conducts the World Orchestra for Peace in Jerusalem, October 19, 2008. Bringing together 95 musicians from 35 countries and 75 orchestras the World Orchestra for Peace was founded in 1995 by legendary conductor Sir Georg Solti, a Jewish-Hungarian émigré who fled his homeland in 1939 as Europe plunged into conflict, to mark the 50th anniversary of the United Nations. Led since Solti's death in 1997 by Russian maestro Valery Gergiev, currently Principal Conductor with the London Symphony Orchestra, Tuesday's concert marks the ensemble's first performance since last year's "Concert for Peace" in Jerusalem. "Listening to the beautiful music performed by this Orchestra helps us to connect with our fellow human beings across different languages, cultures and traditions," says Annan. "The existence of this orchestra reminds us that peace in our world is possible." Following Tuesday's performance -- which features the premiere of a specially commissioned piece by Polish composer and Krakow native Krzysztof Penderecki entitled "Prelude to Peace," as well as Gustav Mahler's perennially popular Fifth Symphony -- the orchestra flies to Stockholm to play a festival marking 200 years of peace between Sweden and Finland. WOP Director Charles Kaye told CNN that it was the unique diversity and internationalism of the musicians which made the group so special. "We've got a young Brazilian violinist called Pablo de Leon who is sitting alongside someone such as Elena Baskina from Novosibirsk in Siberia. And then you have someone like Nabih Bulos who plays with Daniel Barenboim's West-Eastern Divan Orchestra but originally comes from Amman in Jordan. "They really can't speak to each other but they can share the experience of playing together. Music can often do what the spoken word can't." With virtually every musician a concert master in their own right, including superstars of the classical world such as violinist Rainer Kuechl of the Vienna Philharmonic Orchestra and clarinetist Larry Combs of the Chicago Symphony Orchestra, Kaye said the WOP was also "notches above in terms of sheer quality" any other similar ensemble. "We've handpicked the number one players from 70 different orchestras and we are very, very careful," said Kaye. "Nobody can apply to join this orchestra. It is invitation only. This really is an all-star band." But with barely 72 hours to rehearse -- Kaye received the first copy of Pendereki's score only on Thursday -- the director said it was Gergiev's abilities to bring the best out of the musicians which brought the orchestra to life. "In our business Maestro Gergiev is acknowledged as one of the great orchestra trainers," said Kaye. "He can really in 72 hours take 95 brilliant solo musicians and make them into a unity. One of his great skills as a conductor is that he knows how to build an orchestra." In a city which has finally regained its status as one of eastern Europe's leading cultural capitals after the devastation of World War II and decades largely isolated from the West behind the Iron Curtain, Kaye said the orchestra's message of peace through music was especially resonant. "You can feel the spirit of this ensemble. The camaraderie, the friendship and the fact that this message unites everybody," he said. "We are playing because we've got something to say and music can bring that over. When you play a beautiful piece of music with the emotion and the passion that Gergiev and 95 of the best musicians in the world bring to it, people say they can feel there is something at work here. It sounds daft but music has that power."